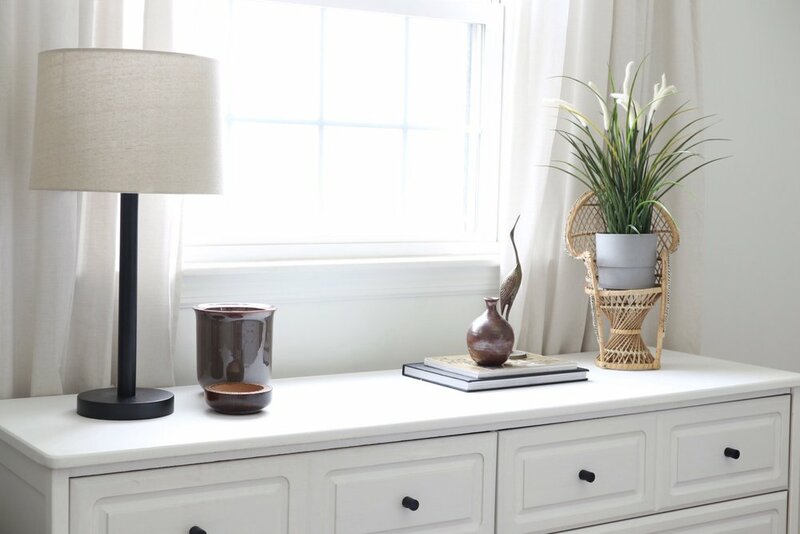 Week 6 of the One Room Challenge is here! 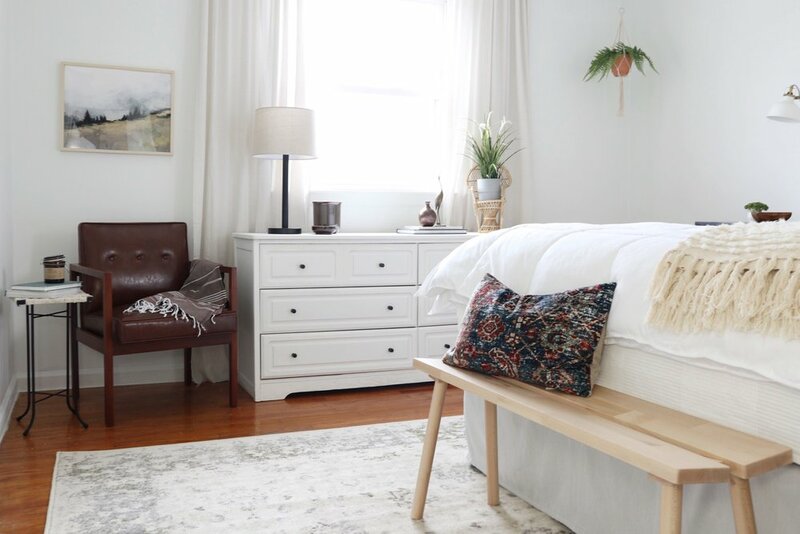 I’m so excited to show the final product of our master bedroom makeover. I’ll let this post be mostly photos (because that’s what people really care about)! But be sure to check back for a second post where I’ll show some more before/afters + progress photos— I’m also planning to go into more detail about why I made certain decisions (and then sometimes changes to those decisions). I really wanted to turn our room into a calm and cozy space. I’m so happy with how it turned out- the pictures really don’t do it justice! I also did my best to keep the cost down- shopping at thrift stores whenever possible (including that brown leather chair for $15!!). Most of the pieces I got were from Goodwill, IKEA, Target, and HomeGoods. That gorgeous print above the chair was provided to me from Sarah Nightingale- the quality of the print is amazing! You can see every brush stroke perfectly! We already had this dresser, I just replaced the knobs with some simple matte black ones I found on Amazon. I love this sleek & modern lamp I found at Target- it’s dimmable and has USB ports! I debated on what to put over our bed for a while, and then I came across this round wall decor I got at Target a couple years ago! I’ll probably replace it once I find the perfect piece of art, but for now I think it works pretty well in this space! I also LOVE that colorful, vintage painting I found at a local thrift store! It adds some fun into the room without being too crazy. We literally JUST added these shelves today and I love them!! Something about how it looked before just didn’t feel right to me. I could have just let it go and it still would have looked fine, but I knew that it could be better! I’m definitely going to paint over the white brackets with the same paint color as the wall so that they blend in more. In this area, I also decided to paint the closet doors this dark gray/black color (Cyberspace by Sherwin Williams). ANDDD I have to put the listing photo in for good measure! There you have it! Thank you so much for following along with my first (but definitely not last) One Room Challenge! Be sure to check out the featured designers + other guest participants, there are SO many awesome designs out there! 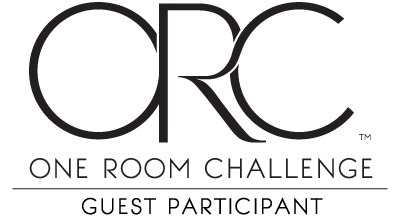 HUGE thank you to Linda Weinstein & the One Room Challenge team for organizing this event! It’s been so fun and full of supportive people! Looking forward to next season’s challenge!